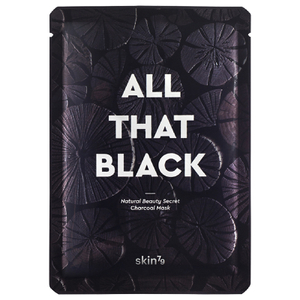 Clarify and refresh your complexion with Skin79's All That Black Mask; a radiance-reviving treatment that works to purify, hydrate and brighten skin. Coated in carbon powder and infused with Rose and Aloe Extracts, the innovative sheet mask effortlessly eliminates pore-clogging dirt and impurities, whilst rebalancing and revitalising skin to reveal a smoother, more refined complexion. Vitamin B3 repairs and hydrates for a plumper, firmer appearance. After cleansing and toning, apply sheet mask to dry skin. Leave for 15-20 minutes, then remove and gently pat the face to absorb excess serum. Continue with skincare routine.